So you want to reach an unlimited audience, have complete control of a broadcast, and get free promotion? Time to Podcast! Podcasts are a natural extension of blogs. They are just another medium to spout your commentary, music, and interviews. 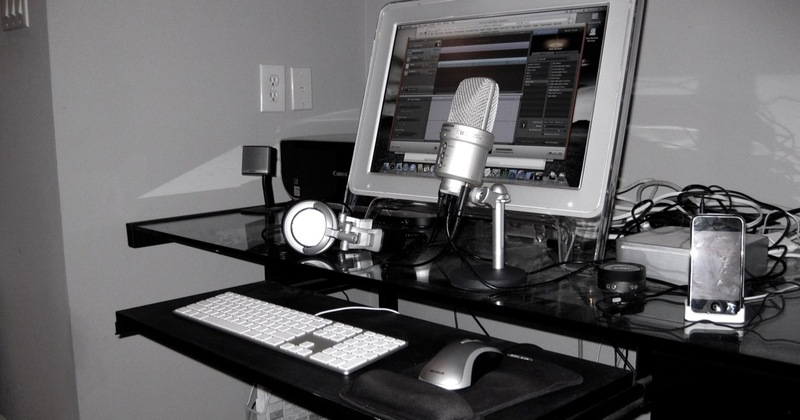 If you’re interested in podcasting, I’ll explain why now is the best time to get started. Hardware has never been cheaper and software has never been more intuitive. Studio-quality microphones are now just about $100. Apple has refined audio making software to the point where mere novices can produce professional-quality results via their GarageBand software. It’s even designed to create podcasts (Apple recently removed some podcast-specific functionality, but podcasts can still be easily created in Garageband). 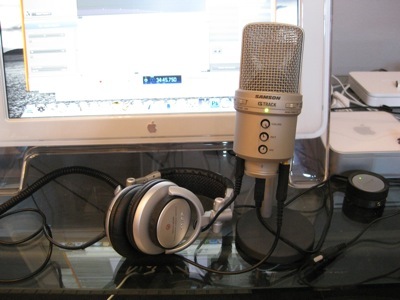 Samson G Track USB Microphone and Audio Interface [UPDATE 8/2013] While the Samson provides great voice recording quality, the Blue Yeti USB Microphone is much more versatile for recording interviews, though it lacks the audio input that the Samson has. and a Mac with Garageband. The Samson G Track microphone gives me the studio-quality recording sound, and the Griffin SmartTalk extension enables me to use my podcast studio to make interviews possible in really high-quality. That’s because cellphones now are digital, and routing the audio through the built-in mixer of the G Track allows very little noise to enter the audio via its USB interface. Tom Keene uses this method a lot for interviewing faraway economists on his Bloomberg Radio shows. I remember being awestruck when I interviewed Bill Rock in his studio space in his home. Bill Rock is an announcer and video producer. He announced for NBC and now for Sirius XM. His studio is crammed with mixers and video/audio equipment. I just have a desk. Comparable to the Samson microphone, the Blue Yeti USB Microphone is more flexible – allowing for omni-direction and bi-directional pickup – meaning you can record several people in the room with great quality. It doesn’t have the audio input interface like the Samson, but with Skype and free audio routing software you could mimic a real audio input jack. I do wish the Yeti was available when I started podcasting. If you want to spend a little more money on a full mobile solution with excellent audio quality you can look at a portable recorder like a Zoom H4n and newer models (which I also own). Recorders like the Zoom H4n have built-in high quality microphones and microphone pre-amps which record with low noise… much lower noise than the USB interfaces. They record to the same SD cards that cameras use. You can then move the audio file to your computer using the card. They also have USB interfaces, but I found they weren’t as clean as actually moving the file. The portable recorders are great for the road and have XLR inputs so you can record from studio mixers and microphones when you are ready. Just realize that you need to be close to the microphone to capture the high quality audio since they are omni mics and will pick up room sounds if you are not close. For the longest time, I never really knew how useful a clapperboard was in movie scenes. Turns out, it’s used to mark where audio and video should be synced in post editing. Audio and video are recorded separately for movie and TV production. If you’re an electronics consumer like me, you might have used a camcorder that records audio and video together. I thought syncing audio and video would be difficult and something only professionals could do. Not so. In my video on street photography, I recorded my audio separately from the video in the opening scene. I used the SmartTalk Headphone Adapter, Control, and Microphone for iPhone as a lavaliere microphone, made a clap noise with my hands (low-rent, I know!) and made sure the camera captured me clapping my hands. It’s important to have a visual so you know where to sync the audio and video. I suggest trying this method with your iPhone. Be sure to use the built-in Voice Memos app, click the record button, and lock the phone so you don’t accidentally stop the recording. Peterson Phone Accessories iPhone/iPad/iPod touch Musical Instrument Adapter Straight Cable and Audio-Technica ATR-3350 Lavalier Omnidirectional Condenser Microphone. The audio quality will be better with this setup. You need intro music, outro music, topics to talk about, guests (or music), editing time, and you need to promote it. Apple does help you out here though. If your podcast is interesting and good enough, they will feature your podcast on iTunes – for FREE. This is how I found a lot of great podcasts including the DJ Cruze Podcast and Adam Carolla Podcast. Don’t forget that iPhones and other smartphones have built-in audio recorders. It’s great for podcasting on-the-go like I did here in my post on digital storytelling with Twitter. Audio equipment isn’t just for podcasts. Use audio in personal and business Web sites. I recently used audio in my new Web site KenMorico.com after reading in the Mediapedia book how powerful slideshows can be. Audio really does add another dimension to a traditional Web site. It certainly makes a “personal” site more personal. The Web is getting a little more personal than it used to. People are now using their real names and photos on Facebook. Many are using their real names on Twitter. (I am one – I highly recommend it.) Some of the most successful social media personalities use their real name and photo. We are more likely to trust them – giving them instant credibility. Audio allows web designers to take this extra leap in personalization. So why should this be a big deal now? HTML5 has been moving forward – allowing many devices to play audio from HTML pages without plugins. Mobile phones like iPhones can play audio from a Web page with one click. iPads can as well. With an HTML5 standard, it makes it worthwhile to place audio on a Web page. Podcast and video production is a lot of work, but it’s an exciting hobby and doesn’t necessarily need to be expensive. With some time and creativity you can produce the type of show you always wanted to hear – your own. You can listen to The Ken Morico Podcast on iTunes to see how my setup sounds.